The core idea for my approach to halting hair loss and promoting the growth of new healthy hair is what I call the scalp exercise. The basic exercise is accomplished by the alternating contraction of the frontalis and occipitalis muscles. The frontalis muscles are at the front of the head; the occipitalis muscles are two muscular slips at the back of the head. These muscles, as you can see in the drawing, are connected by a flat, thin, fibrous membrane called the galea. When these muscles are alternately contracted, the whole scalp moves. The occipitalis muscles do not extend fully across the back of the head. They are separated in the middle by the galea. You will be able to feel these muscles contract when you do the scalp exercise. In fact, a good way to learn the exercise is to place your fingers firmly over these muscles as you try to pull back your ears. You do not use your fingers, though, to pull back your ears. The movement of the ears comes from the contraction of the scalp muscles. You will feel a contraction of the occipitalis muscles if you are succeeding. The three fan-shaped muscles above the ears are the auricularis muscles. These muscles are also brought passively into play (I think) as you do the scalp exercise. They do not move the scalp though. In dogs and cats they move the ears to locate where sounds are coming from. This is a drawing of the occipitalis muscles from the back view. It will help to visualize them as you try to gain control of these stubborn muscles. At first you will tend to tense the trapezius muscles and even the shoulder muscles, but as you learn the scalp exercise the tension in other muscles will vanish. You will be contracting (isolating) only the frontalis and occipitalis muscles. It quickens the blood flow to the whole epicranial area. By epicranial area I mean the skin of the scalp; the layer under the skin, which is called the subcutaneous layer; and beneath this, the muscles and the galea. It strengthens the walls of the capillaries that nourish the hair follicles, and perhaps promotes the growth of new capillaries in scalp tissue (angiogenesis). Read Exercise and Angiogenesis: Two Articles for a further elaboration on this. It increases the flexibility and elasticity of the whole scalp. There is a positive correlation between a tight scalp and male pattern baldness. "Scalp tension is etiologic of MPB." - That is from a current textbook on dermatology. These three things should halt the shrinking of the hair follicles and even reverse the shrinking process, which in turn should halt hair loss and promote the growth of new hair. This simplistic statement needs much elaboration. I'll give this elaboration as you keep scrolling. I arrived at the idea of the scalp exercise after I noticed that bald men like my father and all my uncles had a fringe of hair surrounding the balding area. I also noticed that when these men were eating, when they were chewing food, I could see muscles contracting under this fringe of hair. I thought that the contraction of these muscles and the increased blood flow that muscle contraction requires was perhaps halting further hair loss in this fringe area. "The supply of blood to a contracting muscle is ten times greater than normal." - That is from a recent textbook on molecular biology. I thought that if I could develop these scalp muscles and exercise them regularly, I might be able to halt my own hair loss. I was nineteen years old at the time. My hairline was receding quite a bit especially in the temporal area. I would have been classified as perhaps a two on the Norwood male pattern baldness scale. I had no bald spots though. The hair in the crown area was thick. The bathroom mirror was not my friend in those days. I studied my hairline and agonized over what I saw. There was no desperation in my mood, but there was an angry, sinking feeling. I didn't like what I saw. I was a bodybuilder at that time working out at the YMCA in Glendale, California. Of course I studied the bodybuilding and health magazines. I knew, or at least thought I knew, quite a bit about how the body works. From this superficial study of physiology I got the idea of trying to exercise my scalp muscles. I wanted to see what would happen. After some experimentation I actually learned how to control these muscles. This took less than two weeks. I practiced the basic exercise in front of the mirror for about a half hour twice a day. Soon I didn't need the mirror and would do the exercise when I was listening to music. All this of course was done in private. I did not want (and still don't want) to seem ridiculous. Do the exercise in public and, believe me, people will think you are ridiculous. The exercise seemed to stabilize my hair loss - or at least I thought so. I was naively optimistic. Nothing really happened to my hair for probably six to eight months, but still I kept doing the exercise every day. The reason I kept doing the exercise is that it made my face look tighter, more muscular, and it eased the intense itching of my scalp. But after eight months my hair did start to grow back slowly. Those fine (vellus) hairs that were in the receded temporal area of my scalp were gradually being replaced by thick (terminal) hairs. There was nothing dramatic in this. The process was slow, but that was OK. I saw progress and I was satisfied. The progress continued till my hairline looked almost the way it did when I was fifteen or sixteen. When I got the idea for the scalp exercise, I made a faulty assumption. I assumed that a thin layer of muscle covered the entire top of the cranium. It does not. As you can see in the drawing, there are muscles at the front of the head, muscles at the back of the head, and these muscles are connected by the large, flat fibrous membrane called the galea. But this faulty assumption in no way lessened the effectiveness of the scalp exercise. Now before I discuss the theories why my approach may halt hair loss and grow new hair, I want to examine two positive side effects that will be 100% certain if the scalp exercise is done correctly and for a period of time. The first positive side effect will be a firm-looking forehead and a younger-looking upper face. The frontalis muscles at the front of the head, the occipitalis muscles at the back of the head, and the auricularis muscles, three fan-shaped muscles around each ear, act as master muscles of the upper face. They keep the other muscles smoothly and firmly in place. But as we get older these muscles start to lose their tone and elasticity. When this happens the face starts to sag and the skin begins to droop. The signs of age are there for everyone to see. The scalp exercise will quickly tone up these muscles, and when these muscles are toned up they pull back on the face, keeping it young-looking and expressive. It's almost like a face-lift but without the surgery. The second positive side effect will be a smooth-looking forehead. The scalp exercise will definitely remove the wrinkles from the forehead. It will remove those horizontal and vertical (glabellar) lines that make a person look older. It's a well-known fact that exercise has an invigorating effect on areas adjacent to the muscles, in this case the skin of the forehead. The exercise will make the skin of the forehead more pliable, more resilient. It will give the skin of the forehead some elasticity. Botox will also remove lines from the forehead but it does this at the expense of facial expression. The scalp exercise strengthens the muscles of the upper face; Botox deadens them. I've been doing the scalp exercise since I was nineteen. I have no wrinkles on my forehead. I attribute this without hesitation to the exercise. Please study the anatomical drawings of the scalp muscles above. Knowing where these muscles are will help you control them. It will also help you understand how these muscles, if they are toned up, can give your face a more youthful, vibrant look. As I said, these two positive side effects will be certain if the scalp exercise is done right. But the most important thing about the exercise is its potential to halt hair loss and promote the growth of new, healthy hair - of terminal hair. I want to give four theories now why the scalp exercise will do these things. Theory number one: After five minutes, preferably ten minutes of the scalp exercise, the whole scalp will be suffused with blood. There will be a much quicker flow of blood and lymph fluid into the epicranial area, which includes the hair follicles. As the bodybuilders would say, the scalp muscles are being "pumped up." This quicker flow of blood and lymph fluid into scalp tissue might possibly flush out some metabolic waste products. This could possibly eliminate subclinical inflammation around the follicles. Inflamed follicles are not a good habitat for the hair. I would like to think that the quicker flow of blood and the more efficient lymphatic drainage will expel DHT from the environs of the hair follicles, but I'm afraid that this is just wishful thinking. The current theory about the cause of male pattern baldness is that certain hair follicles produce an enzyme called 5-alpha reductase. This enzyme then converts the male hormone testosterone circulating in the blood into dihydrotestosterone or just simply DHT. DHT has a harmful effect on the follicles causing them to shrink. Dermatologists call this shrinking process miniaturization. A miniaturized follicle can no longer produce a healthy hair. I give a fuller explanation of this process on the Male Pattern Baldness page. Theory number two: The scalp exercise will have a stimulating effect directly on the hair follicles. As I said in regard to removing wrinkles from the forehead, exercise does have a stimulating effect on areas adjacent to the muscles, in this case the skin cells in the scalp. Anything that stimulates the skin cells in the scalp will stimulate the hair follicles because hair follicles are anatomically just specialized skin cells. Theory number three: The scalp exercise will have a beneficial effect on the hair cycle. It will tend to keep the hair follicles longer in the growing stage of the cycle. This is the natural, normal, healthy state of the follicles. Exercise keeps the body, or in this case the follicles, in its natural, normal, healthy state. It's a process called homeostasis. This means that the body tends to revert to its natural healthy state, or at least maintain a healthy equilibrium, with proper exercise, proper diet, proper health habits. Again a bit of a stretch. Theory number four: The scalp exercise will slow down the aging process in the hair follicles. This movement (back and forth) of the scalp during the exercise and the temporarily increased blood flow and more efficient lymphatic drainage in the epicranial area should retard the biological clock in these follicles. I hope that these four theories help explain or make rational why the scalp exercise will halt hair loss and promote the growth of new healthy hair. But I'm sure that if the ideas presented so far have captured your interest, you'll want to go beyond the theoretical and actually learn how to do the scalp exercise. Click My Approach Continued and I'll describe as clearly as I can the way to do it. The galea, or as it is also known, the galea aponeurotica, is a flat, thin sheet of connective tissue that attaches the muscles at the front of the head to the muscles at the back of the head. The auricularis muscles, three fan-shaped muscles around the ears, are also attached to this membrane. (The temporalis muscle, which contracts when food is chewed, is under the auricularis muscles.) When the galea moves because of the alternating contraction of the frontalis and occipitalis muscles, the entire scalp gets a workout. A contracture is the permanent contraction of a muscle. 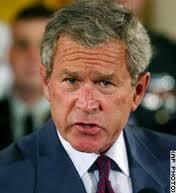 You can see this, for example, in the forehead of President Bush. Stress often produces contractures in the muscles of the scalp. When the scalp muscles are in an almost permanent state of contraction, they tighten the whole scalp. The scalp as a result of this may become rigid and lose its natural thickness and flexibility. Healthy hair follicles, by the way, are 3 to 5 mm long, inserted diagonally. A thin, tight scalp is a poor environment for thick, pigmented (terminal) hairs. The scalp exercise will counteract the forces that predispose a person to scalp contracture. The movement of the scalp muscles during the exercise will quicken the flow of lymph in the whole epicranial area. This increase in tissue fluid turnover will get rid of waste products that probably have accumulated in the scalp. Scalp tissue that is free of cellular debris and metabolic waste products is a healthy environment for hair follicles. I think the scalp exercise is the backbone of an effective approach to hair loss for the reasons I've mentioned in my article. But diet is important too. Eating healthy foods and avoiding unhealthy ones should be should be high on the list. Supplements, though, are a strong secondary source of essential nutrients. I use Brewer's Yeast powder, cod liver oil (not the capsules), Evening Primrose Oil softgels, Black Currant Oil softgels, and vitamin E-200 in wheat germ oil. Of course you don't want to go overboard with supplements. Enough is enough. Real food is always the better source of nutrients.